and it ain't no holiday! Bermudaminx - Venus is supposed to be the easiest! I've actually been struggling to write a blog post for you this week - I have been busy at work and not actually been able to concentrate on puzzling very much. Then I caught the lurgy on Friday and felt like hell. In fact I felt so awful that I couldn't even find the energy to travel down to Birmingham and attend the 22nd Midlands Puzzle Party (sob!!) and meet up with all my mates! I must be pretty ill to miss the chance to meet the only people who actually understand and even sympathise with my madness! 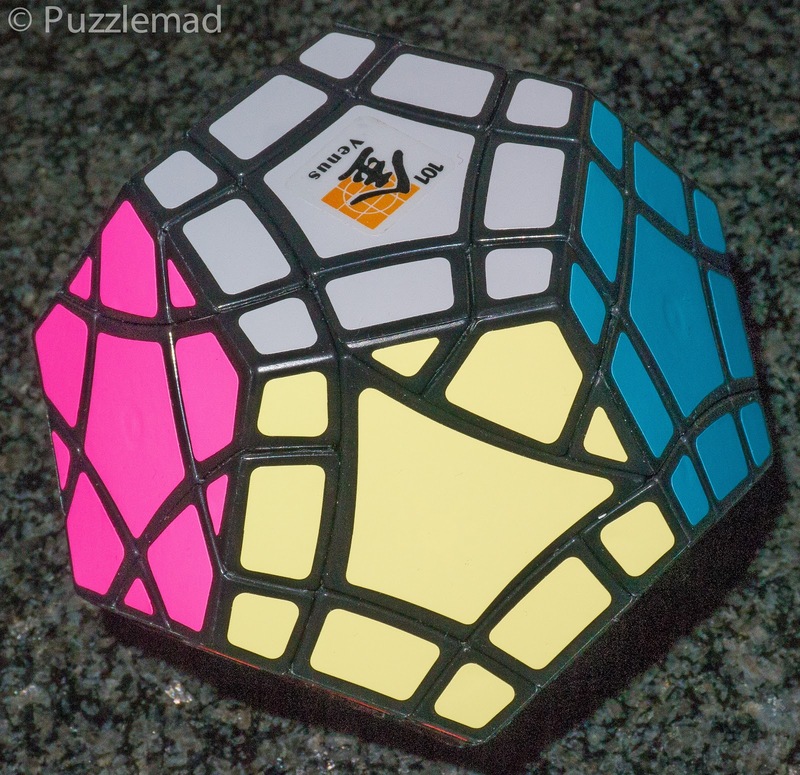 The only puzzles that I have managed to spend time on have been to try a new sliding piece puzzle designed by the incredible Laszlo Kmolnar and not get anywhere at all with it and then in desperation to return to a bit of twisty puzzling. I have a bit of a backlog of twisties that I need to get through before I order some more. My friend Martin has recently lost his job with one of the city councils in England and to try and help support himself, he has set up a twisty puzzle store in the UK offering very good prices - I wanted to catch up with my backlog before ordering a few extras. If you are buying twisties and you live in the UK or Europe then have a look at what Martin has to offer - he's very reliable, in fact you will probably know him from his YouTube channel. Eight scary minxes - the scrambled Mercury has been like that since I got it! I scrambled the Mercury which I just picked at random and tried to solve it for several weeks but every time I started to make progress, I made a mistake and needed to start again and then after a while I realised that I didn't really understand how I was going to go about it. It was too difficult for me! OMG - I had bought all 8 of them and they weren't cheap! I put them down for a while and promised myself that I would get back to them soon......ahem! it seems to have been nearly 2 years since then. 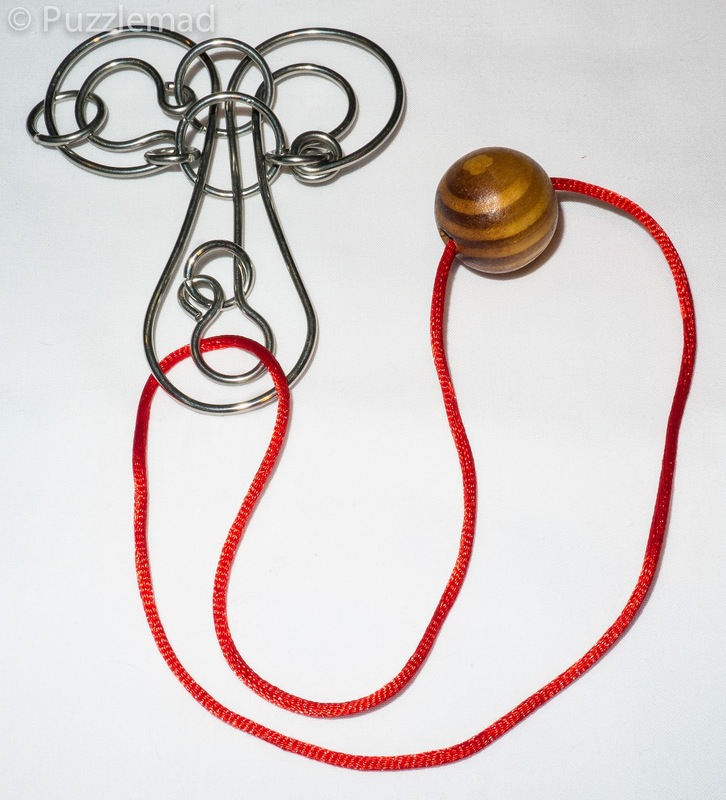 I am slightly ashamed to admit that I have actually carried a couple of them with me every day in my workbag for the entire time and never gotten around to attempting them. Every time I picked them up I shuddered and put them down again. I know, I know, SHAME on me! I have put these aside for the moment and have decided to go back to the Bermudaminxes for a "refreshing change". 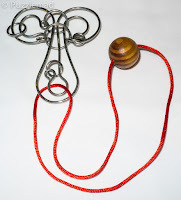 I got advice from Jamie a while back for which order to begin them and he chose the Venus as a suitable start point. This may be the easiest but LORD! my head hurt for quite a lot of the week and Mrs S exercised the laser burning stare and the Whack! Ouch! many times due to my muttering and effing and blinding every evening. So what is the difficulty and why should you have a go? To really describe these I should start at the beginning. The important thing is to look at the name - Bermuda...MINX. These are basically a Megaminx with some alterations made. 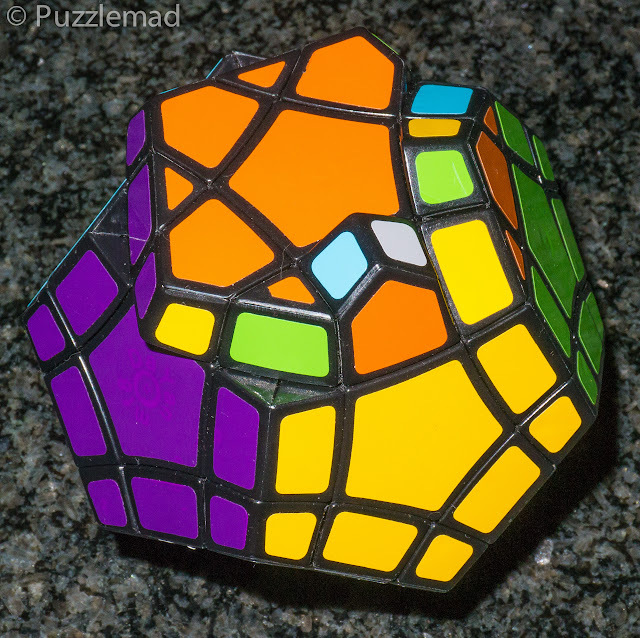 A megaminx is a dodecahedral twisty puzzle which can be solved pretty much in EXACTLY the same way as a standard 3x3 Rubik cube. As you can see above there are standard centre pieces (pentagonal in this case) with single edges between each centre and corners between 3 edges. This is pretty much identical to the make up of a cube. 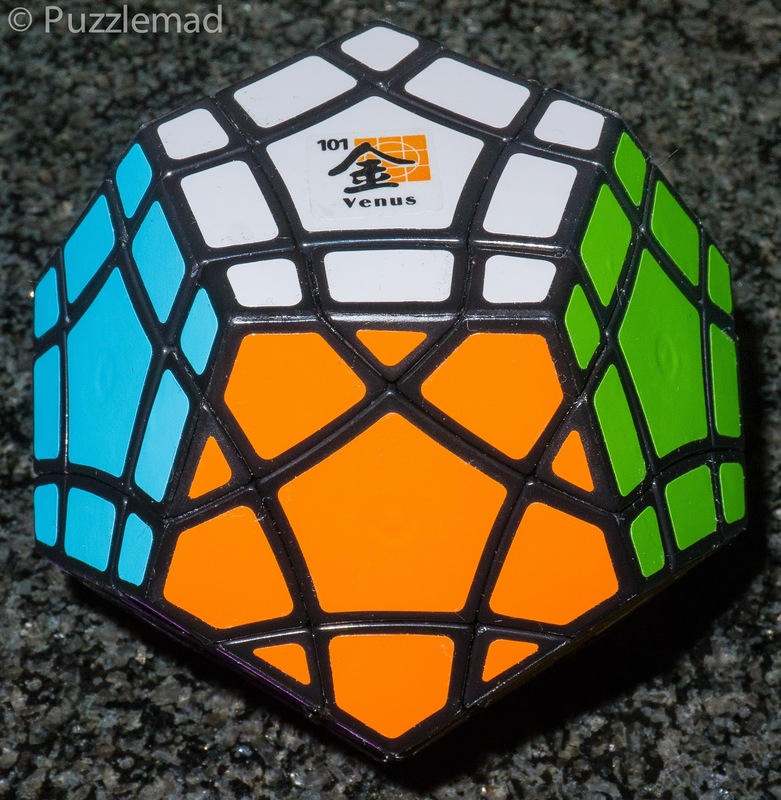 The megaminx solve can be done in a number of ways but my standard is to use what is called "beginners method" and solve bottom edges, bottom corners and then work my way up layer by layer using an edge placement method and intuitive corner placement until I am left with the top face alone. 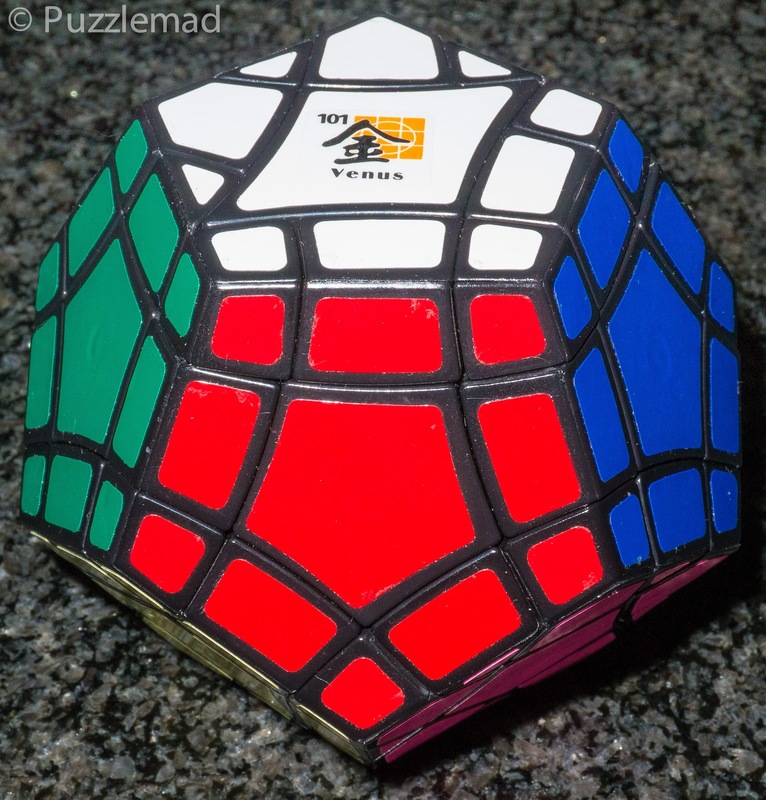 The solve of the top face of a Megaminx is almost identical to a cube in beginners method requiring just a tiny adjustment to each of the simple algorithms. 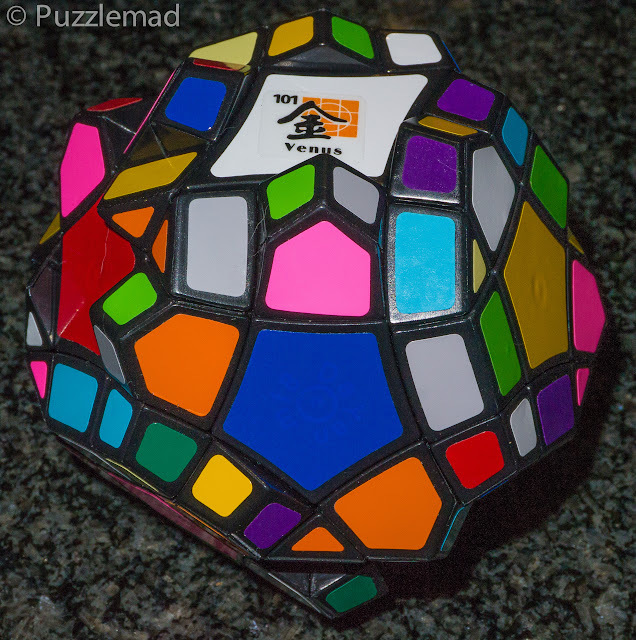 Let me assure you that if you can solve a simple cube then you CAN solve a megaminx. The Bermudaminxes alter things by changing the shapes of various centres to introduce odd positioning and blocking of moves. I have shown the Venus minx which is the one I started with this time around. The top white face shows one of the face types. As you can see, the effect is that it blocks the movement of other faces - the green face cannot move and neither can the one to it's left. The other thing you can see on the right hand image is that the orange face is blocking all the adjacent faces - it needs to be offset by 36º during the solving to allow anything to move. This isn't really blocking but it just means that you have to solve that face with everything skewed and then move it into place at the last moment. Phew! The third face type that you can see above blocks two adjacent faces simultaneously (blue and grey above) and also seriously upsets your thinking. 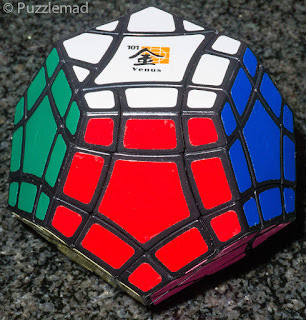 In my first attempt to solve this I determined that this face should be solved upside down which means that again it is essential to solve it without having adjacent pieces matching. This really made my head hurt - even knowing what was required, I kept having to reverse the piece to check that I had placed everything correctly. before continuing with the next phase. Once the basic method is understood - the first thing to establish is which face should be the down face i.e. the start face. It took me a day to realise that my habit of always starting with the white face was causing me a real problem with the end game. Having white down meant that in this particular minx the top half of the puzzle contained both the blocking centre types and they seriously interfered with the way I solve the last face - I could not do it that way! Looking at the puzzle I determined that if I started with the red face then both the hat shaped and the diamond shaped centres would be below the equator and thus would make the first half a challenge but not interfere with the end game much. I went at it on day 2 in this manner and seemed to be making progress. In the top face the beginners method is to ensure the edges all face upwards and then to position them (in the above example this will need to be done in the offset position) and then move onto using a straightforward corner piece series to move the corners into place and finally orienting the corners. 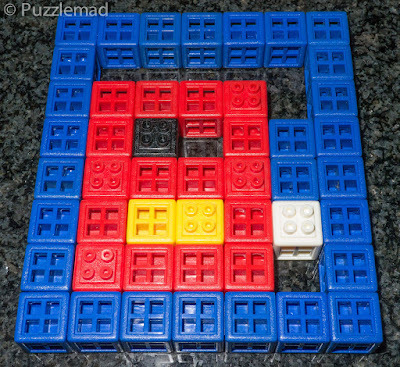 Just like a standard cube the top face should ALWAYS have either 1, 3 or 5 edge pieces facing upwards - above you see that there are 3. In my first solve of this (whilst I was chatting to Derek on FB messenger) I ended up with what we call a "parity" or impossible situation. My situation was that I had only 2 edge pieces correctly oriented and there is no way to flip an odd number of them to get them all the right way around. Hmmm! Why should this be? A megaminx is an odd order puzzle and there are no edges that need to be recreated and possibly have been done so incorrectly. This must be a parity caused by a "false equivocation" or having something set up in some way that could be flipped or rotated and still look the same. To solve this, I immediately understood that the diamond shaped centres could be a false equivocation. I needed to dismantle the white face and rotate the centre through 180º before reassembling it and working back to the end game again. It was just a matter of time and patience and not mucking it up. Let's just say that not mucking it up was a tall order for me - I duly did that and Derek could practically hear my howl of anguish across the Atlantic and the whole of the US continent! Another ½ hour and it was done! Phew - only another 7 to go! I have recently realised whilst looking at the puzzle in detail for the blog post that they actually give even more value for money. The "simple" Venus version was solved with red as the down face but I have just realised that I can also meet the criterion of having both "abnormal" faces in the lower half by solving the green face as the bottom one. This will put the others into different positions and potentially give me an alternative challenge - twice the value for money! 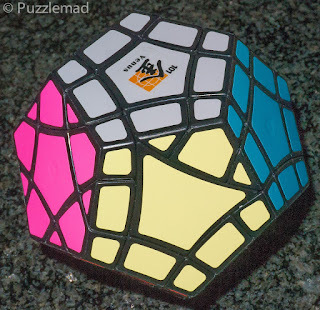 After that maybe I will have to see whether it is possible to solve the minx with the funny faces in the top half. 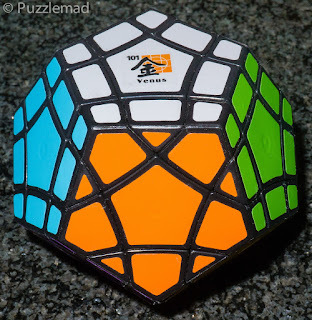 All of that has challenged me before I even attempt any of the others - some of them have the non-pentagonal faces adjacent to each other and some have up to 4 of them in one single puzzle. I actually think that my initial plan to always have them in the lower half will prove impossible with the harder versions - Lord help me! 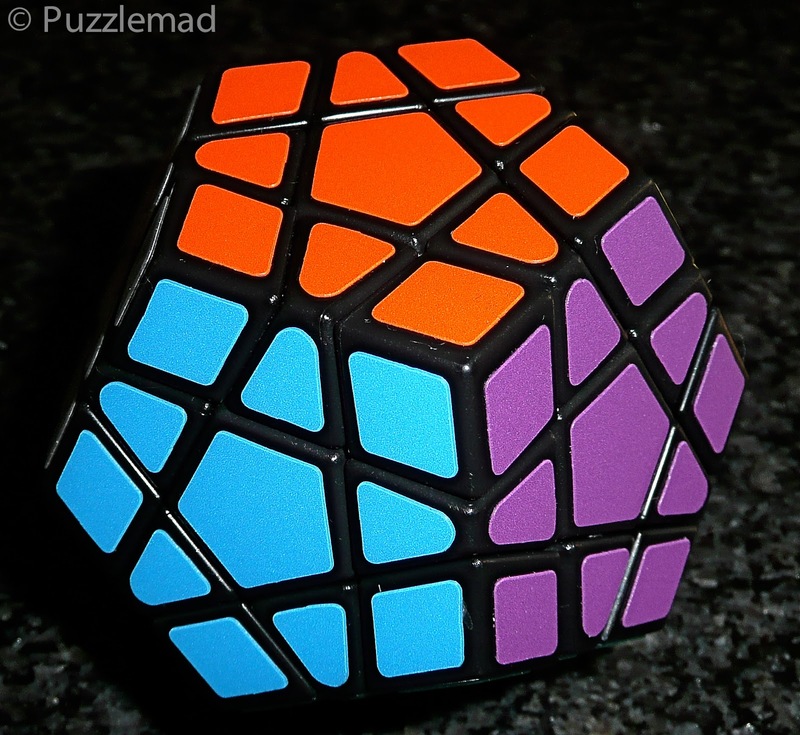 Come on boys and girls - buy a Megaminx and learn how to solve it (no harder than a standard cube) and then buy a few of these Bermudaminxes and try them yourself - you need nothing more than beginners cube method and a bit of thought! I know that puzzlers of your calibre can do it - especially if a dimwit like me can manage. Martin will be able to get them for you - or you can buy them here or here or here. So now I am off to attempt the Venus with green face first and start again on Laszlo's sliding piece puzzle - I have been at it for days now! Wish me luck? I still haven't made the full dive into twisties but this kind of post sure makes me want to. And those tangles are very interesting. Cant wait to hear more about those. Thanks for soldiering on! Go on Mike, you know you want to! 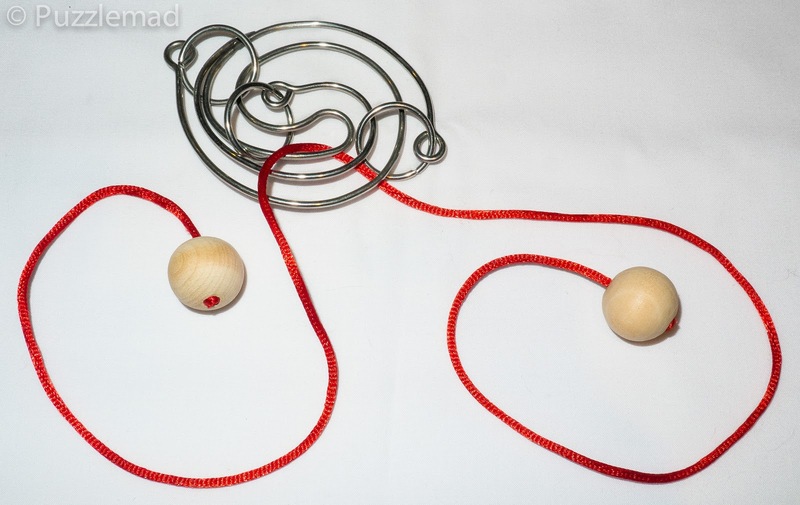 Twisties do provide endless challenges and they are relatively cheap! As for those entanglements - it may be some time. I've been trying for weeks and not got anywhere with them!